Perren-Luc made his orchestral debut at the age of 12 in Italy, followed by playing with symphony orchestras in the USA and Poland. He has won many top prizes in national and international competitions in the USA, Austria, Poland. Solo recital in the Ehrbar Saal in Vienna, a performance in Carnegie Hall. Studies with Tamas Ungar and Mary Humm. Leyla has been entered in the “Golden Book” of young talents of Azerbaijan Republic by the Decree of the President of Azerbaijan Republic and was granted a special President scholarship. She is a laureate of many leading international piano competitions and festivals in Denmark, Belgium, Germany, Poland, Russia, Georgia and Estonia. In 2014 Leyla played a solo concert in the Grand Hall of the Tbilisi State Conservatory. Studies with Kamala Neymalova in Baku. Rae is a prize winner of numerous international competitions in the USA, UK, Poland, Malaysia, Hong Kong, Russia and Singapore. She has featured in the Prodigy series and performed in Basilica di San Pietro with the Perugia Music Festival orchestra; with orchestras in Japan and Singapore; and has been invited to play in festivals in Russia. Studies with Albert Tiu in Singapore. Konstandin has performed in the leading concert venues in Albania, such as the Government Palace, where he played a solo recital, the National Theatre, the Opera House and others. He is the winner of many national awards and has performed with the National Television Orchestra. Konstandin is an award winner of many international competitions, has received a scholarship from the Primavera Pianistica festival in Belgium and will perform with an orchestra in April 2018 as the recipient of the Premio Salieri 2017. He studies in Trieste with professor Teresa Trevisan. Na-hyun was born in South Korea and began playing the piano at the age of nine. She played her first solo concert when she was 14. Na-hyun is the award winner of a number of national competitions and has performed at the DMZ, Sejong and Yewon music festivals. In 2016 she gave her first solo concert in Germany in Goettingen. Studies in Hanover with Gerrit Zitterhart. Won her first award in an international competition in 2011. Since then the 1st and 2nd prize winner in international competitions in Italy, USA, Belgium. Has given solo recitals in China, Italy, Spain, Belgium, USA, Indonesia, has performed with Beijing international chamber orchestra and China Philharmonic Orchestra in Forbidden City Concert Hall. Studies with Bernd Goetzke in Hanover. Sten was born in Denmark and soon moved to Chile where he gave his first concert at the age of five. Since 2006 he lives in Sweden. Sten has performed with a symphony orchestra, won two awards at the international competition in Stockholm and was a semifinalist at the 8th Nordic Piano Competition in 2017, as well as a recipient of a number of music scholarships in Sweden. Studies with Julia Mustonen-Dahlkvist. XueLin began playing the piano at the age of three, studied at the conservatoire in Guanzhou and later at the Wells Cathedral School and the Royal College of Music in London. He has won awards at several national and international piano competitions and has given a number of piano solo recitals in China. In 2014, he was invited as one of the finest young pianists in China to perform for the prestigious Boao Summit Forum for World Youth that was broadcasted around the world. Asta Dora began playing piano at an Icelandic Suzuki school. She has attended numerous master classes in Iceland and the UK and has won awards in national competitions. 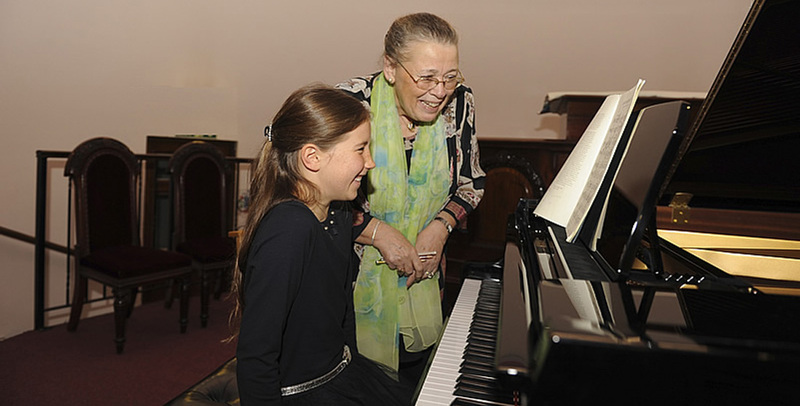 Asta Dora performed at the reception of the President of Iceland at his residency and received a prize at the Chopin competition for children in Szafarnia, Poland. Studies in Iceland with Kristinn Örn Kristinsson.